For most of us the end of the year is a time to reflect more than usual upon our lives. All of us are at different stages of life. Across age lines we take time to consider the course of our lives. Some of us look over the past year. Some look over the course of their whole lives. And some look toward the reality of death which we shall all face. In the year of this painting (1835) Caspar David Friedrich (1774-1840) suffered a stroke and although having been recognized as a distinguished painter by his contemporaries languished in poverty. Along with seeing the vibrancy of life Friedrich had a deep understanding of the fragility of life and our mortality that he translated into profound visual understanding in his work. Reassuringly this painting by Friedrich presents us with a calm setting looking to a seaside horizon. On a low, rocky promontory jutting out into a harbour we see an arc of five figures as our eyes move from the left to the right. Slightly to the fore is an elderly man looking out at the sea, then a middle-aged man facing toward us followed by two children hoisting a flag with a woman leaning toward them. All of the adults point toward the children. On the horizon are five sailing vessels resonating with the five figures on the shore. Again our eyes move from the left to the right to see a boat near the shore. Further to the right the sails of the large central vessel are either being lifted or taken down. Then we see a lithesome ship near the shore that echoes the posture of the reclining woman. More faintly further to the right two ships are in full sail at the horizon line. It is ambiguous whether the ships are coming or going. 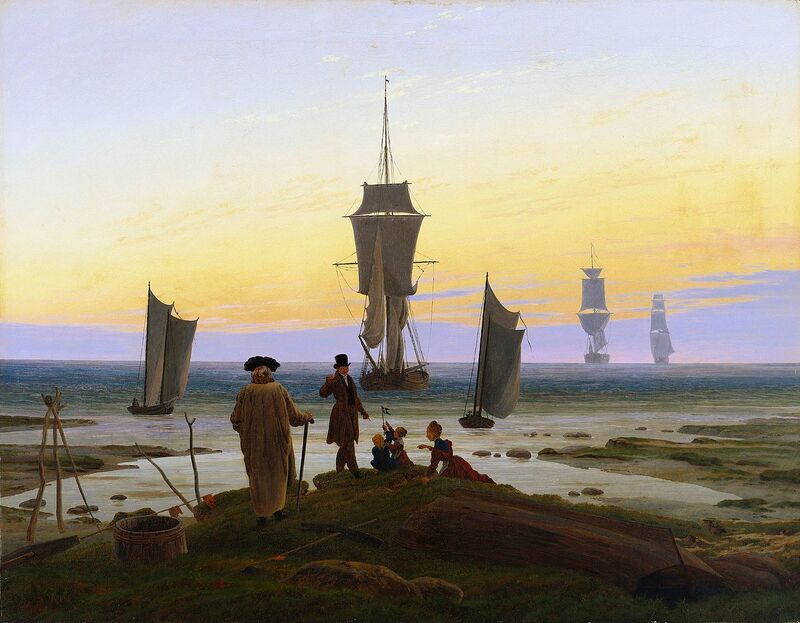 In this painting Friedrich gives us familial generations as indicators of the past, present and future as he engages our imaginations by ships suggesting our voyages through life. Reinforced by the dominating ship behind him the well-appointed man in the prime of life bids us with his right hand to the present, while his left hand indicates that the future lies with his children. On the left, balancing the craft corresponding to the woman on the right, is a small ship possibly setting out to sea and intimating the ultimate unknown journey we shall all make to eternity. For Friedrich, a dedicated believer, landscape or seascape were never a ‘background’ for his art, but an indication of God’s encompassing, pulsating presence surrounding our daily lives through creation. This is not in some pantheistic sense, but notably Trinitarian in the tradition of reading God’s Word in both the world he created and the written record we have in Scripture. At the far left three stakes are poised against each other. The triangular headland these people stand on suggests that all human existence is based on the Holy Trinity even as a ‘trinity’ of ships embraces them. The composition is even edged with triangular spits of land jutting out into the sea, but also connecting with the mainland and earthly life. Notable also is the suggestion of a massive x-shaped cross formed by the beams of light that reflect on the water that surrounds the headland. There is also the wonderful ambiguity of interpreting the horizon in the works of Caspar David Friedrich. One wonders and never knows whether the sun is rising or setting until one realizes it is both! It is rising for some and setting for others of us. Rising or setting, all of us need God’s mercy, peace and love in abundance for the New Year. Caspar David Friedrich: The Stages of Life, 1835, oil on canvas, 72 x 94 cm, Museum der bildenden Künste, Leipzig, Germany. Caspar David Friedrich (1774-1840), born in Greifswald near the Baltic Sea as the sixth son of a soap merchant, was a German painter and draughtsman of the Romantic era. In 1787 he broke through the ice while skating and was saved by his brother, who drowned in the course of rescuing him. This remained a lifelong trauma. In 1794-1798 Friedrich studied at the Academy of Copenhagen. In 1798 he moved to Dresden, where he stayed for the rest of his life, from 1824 working as professor at the Academy of Dresden. In 1835 he became partly paralyzed due to a stroke. After his death in 1840 he was soon forgotten, but rediscovered at the beginning of the 20th century. The renowned German poets Goethe and Novalis were among his friends.